Three-dimensional digital rendering offers scholars an astounding ability to visualize and understand manuscripts and fragments in ways that mere 2D photography cannot provide. But despite this promise, 3D has not been widely applied as a method for capturing facsimiles of ancient manuscripts. The acquisition and reconstruction process is not a simple one, and only now has the technology become commoditized to the point that its use is practical for some of the world’s most difficult and interesting material, such as the Bodleian Libraries’ PHerc.118. Bodleian Libraries, MS. Gr. class. b. 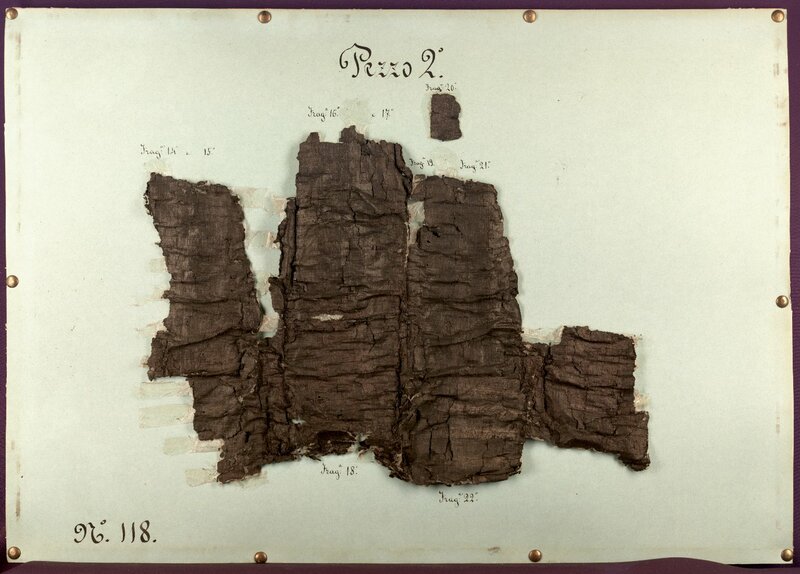 1 (P)/1-12, or, PHerc.118, the charred remains of a papyrus scroll, recovered from Herculaneum, and ‘unrolled’ in 1883-84; now preserved in 12 trays of fragments mounted to glass. In 1802 King Ferdinand of Naples sent George IV an unusual gift - a number of carbonized scrolls - in exchange for a royal giraffe for his private zoo. The scrolls were highly prized artifacts, coming from the recently discovered cache of papyri found in the ancient city of Herculaneum that had been destroyed by the eruption of Mt. Vesuvius in AD 79. The four scrolls that George IV subsequently gave to the Bodleian Library had been flash-heated by the pyroclastic flow of rock and ash, which preserved them as intact and tightly wound tubes, but which also rendered them brittle and extremely fragile. Nonetheless, much optimism existed around the potential for physically unrolling the scrolls. Therefore, in the late 19th century one of the scrolls - PHerc.118 - was sent to Naples to undergo the physical unwrapping method of the day. But what returned was a fragmentary mess: twelve disjointed pages of papyrus displaying only a fraction of the text that was likely inside the scroll. The conservators of the day were aghast at the damage that had been wrought. Each “page” consisted of multiple layers of flattened papyrus stuck together and glued down into a glass tray. Any attempt to separate these multiple layers and risk additional damage was unthinkable. Clearly reading and understanding the visible writing on this layered surface proved impossible. Each fragment was uneven and warped, obscuring and distorting some of the letters. In addition, because the physical unwrapping process had effectively peeled the scroll apart, pieces from one wrap of the scroll wound up stuck to other fragments, and no one could determine where the jumbled mass of letters and words actually belonged. Disegni, or hand drawn “sketches,” were made of the visible text at the time the scroll was opened, but as they were simply renderings of what the artists could see with their naked eyes, these drawings did not clarify the layer problem. There was no way to determine the consistency of the layers vis-à-vis the text - in other words, whether or not the writing visible on each fragment tray was from a consistent wrap of the scroll or if the words came from different sections. Bodleian Libraries, MS. Gr. class. c. 7 – a ‘disegno’ or sketch of PHerc.118. Eventually, the invention and advances of photography allowed a much clearer representation of the visible text. 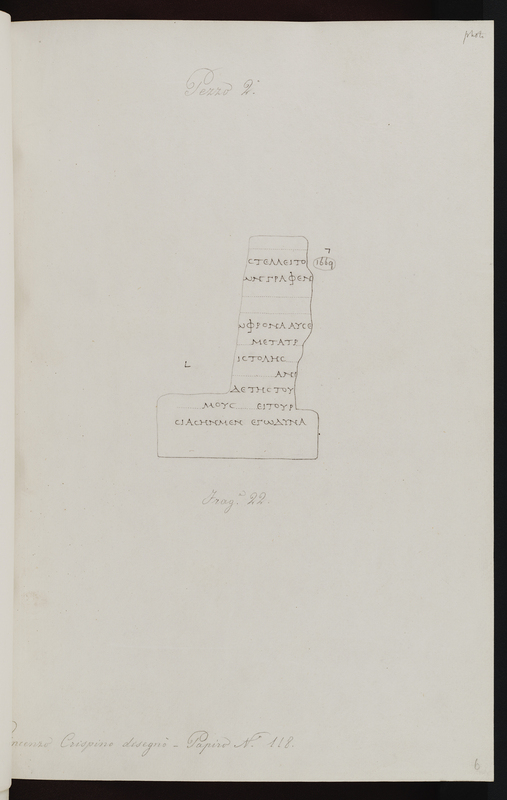 But an accurate reading of the passage still depended on determining which words and letters belonged together on which layer, and this required accurately depicting the “dimensionality” of the fragment surfaces. At the end of the day neither visual inspection, nor the disegni, nor 2D photography could solve this significant problem. In recent years, however, advances in digital 3D rendering have thankfully made it possible to replicate the actual surface shape of an object with all of its layers, ridges, holes, and contours. 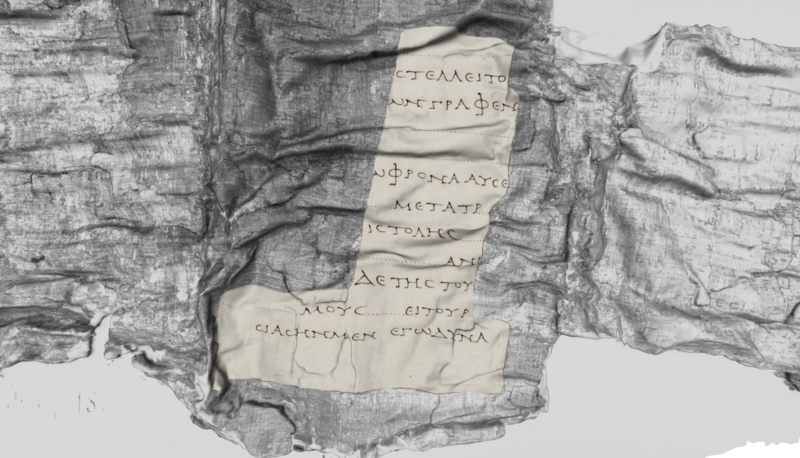 In 2016, our team, for the first-time ever, created a complete 3D facsimile of PHerc.118, revealing the writing on and within the fragments in ways never before seen. W. Brent Seales and Seth Parker use an Artec Spider 3D scanner to image tray 2 of PHerc.118 as David Howell (Bodleian Libraries) looks on (video 1). Using an “Artec Spider,” an off-the-shelf, handheld 3D scanner (see video 1), we created a detailed and accurate 3D shape model of the papyrus fragments housed in each of the 12 trays of PHerc.118. 3D scanners work by projecting light in a pattern onto an object, and then registering the shadow variations or deformations from multiple angles, creating triangles that can be used to calculate the distance to specific points on the object. This information is then used to produce an accurate estimate of the “profilometry,” or exact topographical shape, of the surface of the opened papyrus. Profilometry refers to the textural and dimensional character of an object’s profile or surface, including its height, curvature, and other geometry. As mentioned earlier, when the scroll was peeled open, the wraps did not separate cleanly from one another. The result was a bundle of 3, 4, 5 - no one really knows how many - layers that adhered to each other. At each point where one wrap was torn away and stuck to another, a ridge was created that can be seen in the 3D model of the fragment (see video 2). 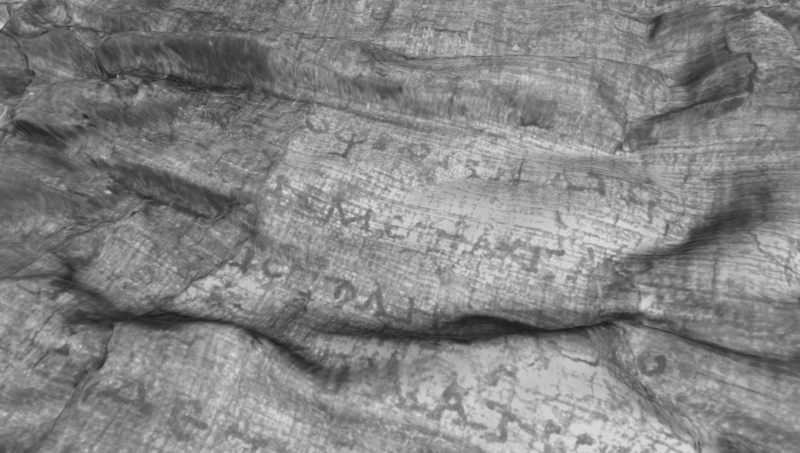 These visible ridges give scholars additional information and clues that help them navigate the landscape of the text on the surface of the fragmented, torn, layered papyrus. From charred, fragmentary remains, to a full 3D rendering of PHerc.118 and with historical drawings overlaid (photo set 1-4). In contrast, when one views a flat, 2D photograph of the fragment, one can only see letters on a flat plane all together, and therefore cannot tell exactly where one layer ends and another begins. This ambiguity makes it impossible to clearly understand how the words and letters work together to render meaning. As a result, scholars prefer not to work just from a photo of the papyrus, but also want to see the physical document, usually under extreme lighting conditions, so that they can visualize the topography and better elucidate the meaning of the text. 3D modeling provides a powerful surrogate that allows them to do the same thing without having to make the often complicated arrangements to see the actual artifact. The Artec Spider is a surface shape reconstruction device, not a high resolution camera. Therefore it is a powerful tool for digitally mapping out and molding the topographical shape of an object’s surface, but is not the best option for capturing the photographic details, such as color and sharpness, that one would desire for reading text. The dark color of the carbonized papyrus makes it difficult to create any clear facsimile of the writing, since black ink appears on a black surface. To address this challenge, our process uses one technology optimized for capturing the shape - digital 3D modeling as we described - and another optimized for capturing the appearance of the text, in this case historical photography and hand-drawn images, to create a completely enhanced version of PHerc.118 (see photo set 1). The surface color captured by the Artec serves as an “alignment backplate,” providing a target image to which we align all historical photos - including the disegni sketches. This alignment of all known photos of each plate to its canonical and accurate shape model brings all facsimiles together into one highly detailed composite image. 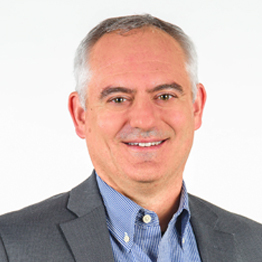 It is a powerful combination of the remarkable resolution and contrast of high-resolution digital photography and imaging with the power of 3D modeling dimensionality. Tray 2 [Pezzo 2] of PHerc.118 fully rendered in a 3D viewer with the ability to switch between light and contrast options (video 2). Although it is astonishing to see the exact profile of the opened Herculaneum papyri in the 12 trays of PHerc.118, the real 3D “action” occurs when this combined texture and shape representation gets into the hands of scholars. We are only now starting to see the new textual discoveries and revisions of how the writing is actually situated - layer by layer - as we release these complete models to scholars who can read, understand, edit, and interpret the texts in the context of their proper location within the scroll. While the destruction caused by the physical unwrapping of PHerc.118 is regrettable, irreversible, and never again to be repeated, the miracle of 3D in action can redeem that damage. By bringing more accurate and compelling images of the document to the computer desktop of the scholar, these texts, which have been left languishing in their visual poverty for decades, can now experience renewal and rebirth as they reveal their secrets about the ancient world. 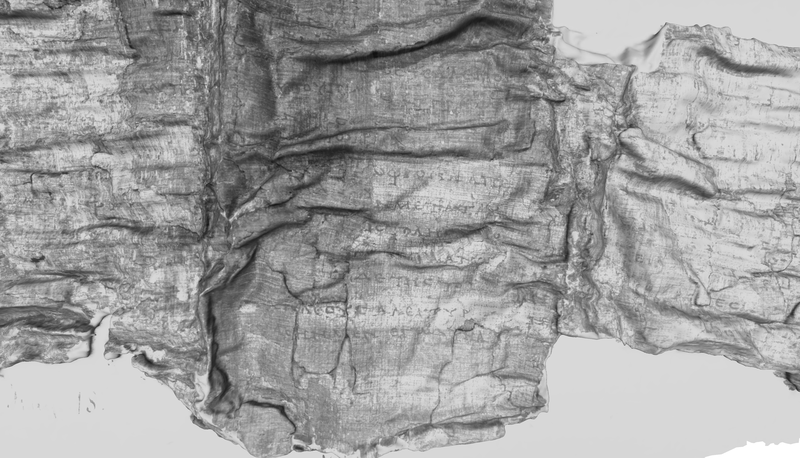 Virtually Unwrapping the En-Gedi Scroll, work done by the Digital Restoration Initiative Team, led by Prof W. Brent Seales, University of Kentucky. “Scanning an Ancient Biblical Text That Humans Fear to Open” (New York Times, 5 January 2018). “History Unwrapped: A computer scientist reveals the text of ancient documents beyond repair” (Discover Magazine, 9 May 2017). 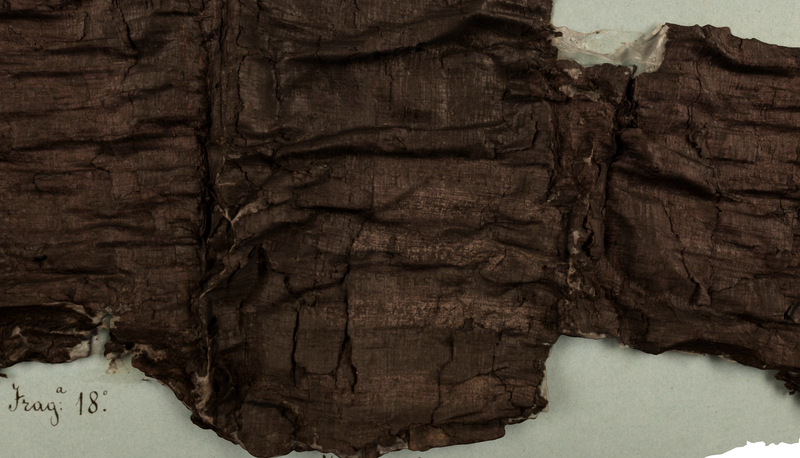 “Modern Technology Unlocks Secrets of a Damaged Biblical Scroll” (New York Times, 21 September 2016). “The Invisible Library: Can digital technology make the Herculaneum scrolls legible after two thousand years?” (New Yorker, 16 November 2015).